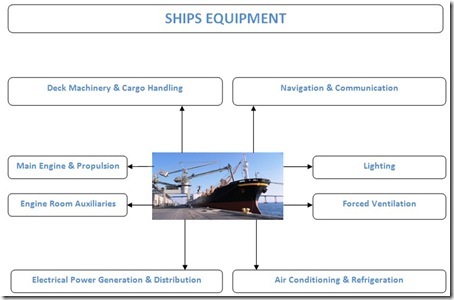 The aim of this post is to make you understand the various machineries, systems and equipments that make a ship to sail. Cruise ships and international passenger ferries. 1. Lighting: As most of the ship is enclosed, natural light is available only on upper decks exposed to atmosphere. Internal parts of the ship require artificial lighting powered by electricity. Also, navigational lights powered by electricity are provided for safe navigation. 2. Forced Ventilation: Natural ventilation is also not available in the internal parts of the ship, like restricted natural lighting. So forced ventilation is provided by means of supply and exhaust fans or blowers fitted in different parts of the ship which are powered by electricity. 3. Air Conditioning & Refrigeration: Machinery/Engine Control Rooms have mostly electronic equipment. Mariners manning these, also have to be fatigue free. So, air conditioning is a necessity. Also the living spaces or crew accommodation needs air conditioning. As the ships remain at sea for longer duration in weeks and months, food items have to be stocked in cool and cold rooms ie needs refrigeration. Air conditioning and Refrigeration machinery are powered by electricity. 4. Main Engine & Propulsion: Like we have legs to swim, ships have propellers to move. Propellers are powered by main engines which may be diesel engines or by huge electrical motors if it is electrical propulsion. Also, sophisticated electronic, electro hydraulic or pneumatic control systems are associated with this main engine and propulsion system. 5. Engine Room Auxiliaries: To operate the main engine and propulsion system and other utilities onboard pumps, compressors are provided which are powered by electricity. 6. Deck Machinery & Cargo Handling: To raise/ lower ships boats (for life safety and harbour use), winches are provided. To raise/lower ships anchor, capstans or windlass are provided. For cargo handling, cranes are provided. All these equipment are electric or electro hydraulic. 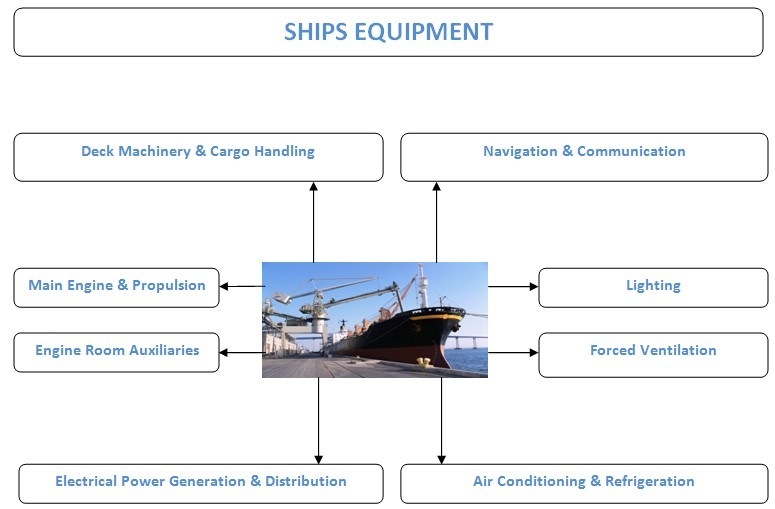 Also radio communication equipments are provided for ship to ship and ship to shore communication. Almost all of these equipment work on electricity. 8. Electrical Power Generation & Distribution: To meet all the power requirement of the equipments discussed above, Main Generators are available which have mostly diesel engines as prime movers. Also Emergency Generators are available, to power essential loads of the ship. If you have any questions feel free to ask via comments.